The PCE-VT 204 vibration meter is an outstanding device due to its multi-functionality. The vibration meter is able to measure three parameters of vibration and can also be used as a tachometer. Besides the vibration monitoring of motors, gears, wheels and gear boxes our vibration meters are suitable for measurement of speed of rotating machines and installations. The submitted acceleration sensor can be attached on the whole surface, equipped with a magnet or can be combined with a bolt-on needle (included in delivery). 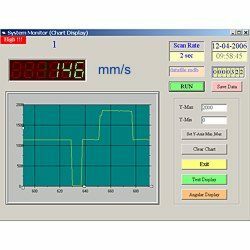 Readings can be transmitted from the vibration meter to a computer using the optional software package (can be ordered additionally). The internal frequency filters suppress background noises, therefore the appliance could record just the specific vibrations. This link shows another vibration meter that allows machines to be tested acoustically. Here you can see an overview of the vibration meters we have available to suit your needs. 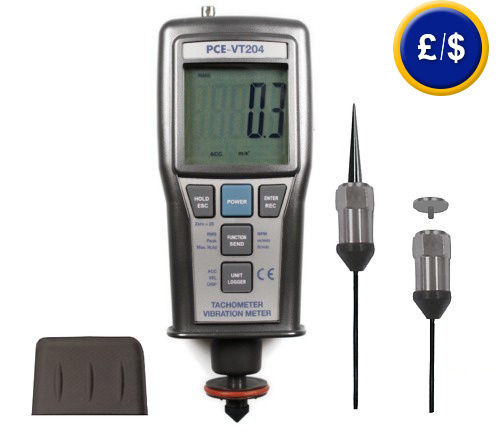 The image above shows the PCE-VT 204 vibration meter and all the additional sensors, adaptors, wheels and cones to be used as a tachometer, magnet and fastening screw. It is a must for every technical department. Measurement Range Rotations (optical) 10 to 99999 r.p.m. Rotation (by contact) 0.5 to 19999 r.p.m. Operating conditions 0 to 50ºC / <80% r.h.
PCE-VT 204 vibration meter, support sensor with 1.5m cable, 50mm needle sensor, magnetic base, measuring cone, 600mm of reflective tape, carrying bag, 4 batteries and instructions. For every company that wishes to include this vibration meter into their internal quality control department or for annual recalibrations. This certificate meets the DIN ISO standard and contains a certificate with the values used for calibration. It also contains details for the company that owns the device. This procedure refers to vibration measuring. For every company that wishes to encompass this vibration meter into their internal quality control department or for annual recalibrations. This certificate meets the DIN ISO standard and contains a certificate with the values used for calibration. It also contains details of the company that owns the device. This procedure refers to measuring rotations. The software is required for transmitting data from the internal memory of the device to a computer. The data can be exported to other programs such as Excel afterwards. A USB cable is included. In the case that measurement points get lost or damaged, it is possible to order replacements.